Ventadehostingencolombia.com Review 2019: Is Ventadehostingencolombia.com a Good Hosting? Ventadehostingencolombia.com sells shared hosting with SSD storage. There isn’t an uptime guarantee, but the plans support plenty of features for experts and beginners (albeit with a few older software version thrown into the mix). Ventadehostingencolombia.com has been in business since 2010 and currently has more than 400 customers. It has a clear mission to provide high-quality hosting at an affordable price for SMEs and startups. Its focus appears to be on providing hosting services in Colombia and the website is only available in Spanish, but support can also be provided in English. The plans use SSD storage, which means you should experience disk read/write speeds up to ten times faster than traditional HDD. The servers also run on CloudLinux, which isolates your data from your neighbors in a shared hosting environment, protecting you from any spikes in traffic or malicious traffic. The support for PHP is low, with only version 5.3.2 included, which is twice as slow as the newer version, 7. There is, however, support for another advanced scripting language, Ruby on Rails. As well as FTP access, MySQL databases, phpMyAdmin tool, there are also Cron jobs for repetitive tasks. If you are a beginner, you will likely be pleased to see a website building tool with more than 1,000 RV Site Builder templates and Softaculous one-click installer for an unspecified number of programs. I can tell you that all of the common ones e.g., Joomla!, WordPress, Drupal, Oscommerce, and ZenCart are included. It’s not clear from the website whether there’s an uptime guarantee. It states 99.9% airtime, but after chatting with the support it became clear that this was not backed by an SLA. The prices are good value for money and definitely cheaper than other similar companies. Do consider that SSL certificates and a domain name will need to be purchased as well as the base plan. Plans can only be bought on one-year terms, which although restrictive, is quite normal for this type of budget brand. While not an issue for Colombian or Spanish speaking customers, however, if you’re an English speaker (like me), a small consideration is that it’s hard to translate the checkout process into English. Customer service is by phone, email, and live chat. I couldn’t find any business hours advertised and there aren’t any help documents, so you will have to be happy relying on customer service in the event you have any issues. 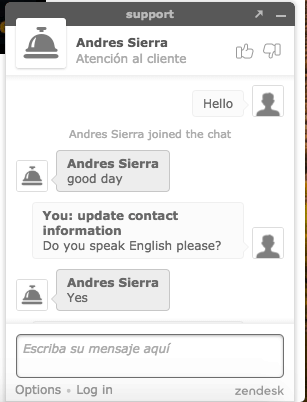 I hopped on live chat at around 8:30 a.m. on a weekday in Colombia. Even though I was “position 1”, I hung around for a few minutes for someone to pick up. The operator was happy to chat with me in English and answered all of my questions in full. Ventadehostingencolombia.com sells hosting which uses LAMP (Linux, Apache, MySQL, and PHP). Don’t be deterred by the old-fashioned website, the plans are well-priced with a decent level of resources – as long as you’re happy with an old version of PHP. Wondering how Ventadehostingencolombia.com stacks up against other Web Hosting companies? Enter any other Web Hosting company and we will give you a side-by-side comparison.